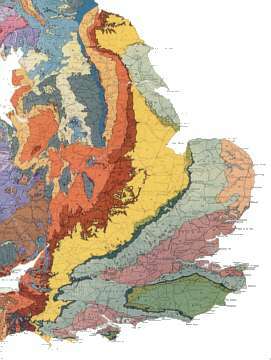 The geology of Britain can be very complex. This post presents a simplified explanation, which covers the main features of the Warwickshire landscape. Beneath the surface of England is a series of layers of deposits. There are very ancient deep rocks, and on top of these successive layers of younger deposits (like a layered cake). The entire country has then been tilted, upwards at the North West, and the top surface eroded (a large slice taken horizontally off the top of the tilted cake), so that bands of older rocks can be found at the surface in the North West, and progressively younger rocks are at the surface moving South Eastwards. This picture shows the bands of rocks, near the surface, across England. (1) North West of the Avon, beneath the former Forest of Arden, is a band of older rocks, called Triassic Mercia Mudstone (also called Keuper Marl, Keuper Red Sandstone, and Arden Sandstones). The slightly hilly areas in this region, are due to variations in the hardness of the sandstones. These rocks date from 250Ma-200Ma (Ma=millions of years ago). Fossils have been found suggesting sand flats in a hot arid climate. (2) Between Kenilworth, Tamworth and Nuneaton an anomalous island of older Carboniferous Coal Measures is exposed. These older rocks, which contain layers of sandstones and coal have been pushed upwards through the Triassic Mercia Mudstone, and the soft mudstones eroded away. The coal seams are near the surface in the North of the area, but run progressively deeper to the South. The rocks in this area date from 300Ma-350Ma. (3) Between Nuneaton and Atherstone is a narrow Pre-Cambrian Volcanic ridge. These are very old rocks indeed and date from 600Ma-500Ma. Quartzite, a hard volcanic rock, has been quarried commercially near Nuneaton. 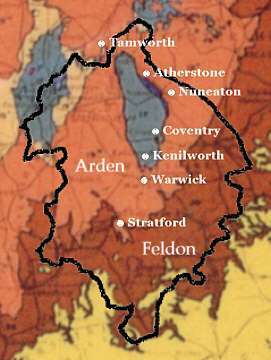 (4) South East of the Avon, the Feldon, is the next younger band of rocks in the main sequence. These were laid down about 200Ma, and are called Jurassic Lower Lias Clays. These form heavy poorly drained soils. (5) In the far South East is a still younger band, the Edge-Hill escaprpment, not visible on the map. This is called Middle Lias. It is a 150 feet thick band of brown sandstones, laid down 150Ma. (6) In the extreme South East is the edge of the Cotswold escarpment, an even younger band of Jurassic Limestone, dating from 140Ma. At times between 400,000 - 10,000 years ago the area was covered by ice sheets. When this ice melted large amounts of glacial deposits were dumped, particularly around Dunsmore Heath. Many Warwickshire villages are located on top of these deposits as these give easy access to sub-surface water. The coal deposits mean that the entire area was, at one time, sub-tropical forest. The sandstone means that the entire area was, at one time, desert. The limestone deposits mean that the area was, at one time, warm shallow sea. 500 million years ago (Cambrian Period), when primitive life was forming in the seas, the entire land mass of England was situated near the South Pole. England, Wales, southern Ireland, and a small part of NE America formed a drifting subcontinent known as Avalonia. 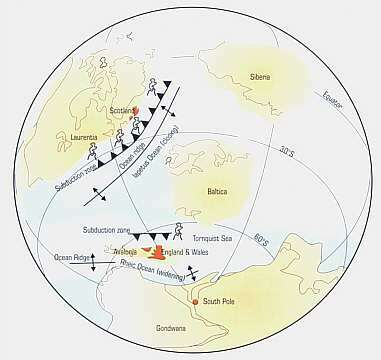 On the diagram shown right, just North of Avalonia, is a line drawn like a weather front labeled "subduction zone". This is where sea bed was being forced down beneath the subcontinent. Subduction zones cause volcanos. The volcanic rocks near Nuneaton date from this period. The Snowdonian range, also extinct volcanoes, also dates from this period. The volcanic rocks near Nuneaton contain important fossils laid down when England was located near the Antarctic Circle. Rocks near Nuneaton have been dated 615Ma. 4cm x 100,000,000 year = 400,000,000cm = 4,000km. By 350Ma (Carboniferous Period) England had joined up to Scotland. The Scottish Highlands were created by the continental collision of these two land masses. Britain was then situated near the equator. This is the time that early tropical forests and swamps were forming what were to become coal measures. The coal seams alternate with sandstones and clays, as the land was periodically inundated with river deltas and tropical seas. By 290Ma Britain was at latitude 25N, typical of the Sahara or a Caribbean climate. Around 250Ma (Triassic Period), the Mercia Sandstones were being formed from sandy desert. Around 150Ma (late Jurassic Period) warm shallow seas were forming the limestones of the Cotswolds. This type of limestone is called "oolitic". This is not a marine creature, but is a physical precipitation of calcium carbonate, although it does include marine fossils. This type of precipitation is occuring near Bermuda today. The tilting of England occurred between 60Ma and 2Ma (Tertiary Period). This was caused by a mantle upswell beneath the Irish Sea. This raised the North West of England by up to 2km, causing a 2-degree tilt across the country. In the North West of England up to 2km of upper layer rocks have been eroded from the upraised surface, exposing the older rock layers below. About 200,000 cubic kilometers of eroded material have been deposited in the North Sea or Atlantic. Because of the presence of coal measures in Warwickshire the region was been extensively explored with deep boreholes, and the underlying geology, which is quite complicated, is known with some detail. The diagram shown left is one which I constructed based on information in a British Geological Survey publication 'Geology of the Country Around Warwick'. The map might not be precisely accurate, although the main features are. 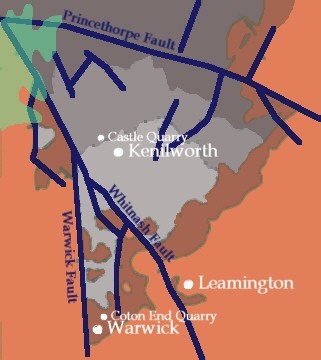 It shows the surface rocks in the Kenilworth/Warwick area. The grey tones are the older carboniferous period rocks. The dark grey, in the North is called Tile Hill Mudstone, the mid-grey is called Kenilworth Sandstone, the light grey is Ashow Foundation. The younger rocks of the Jurrassic period are in terracota color. The light colour, in the outer region, is the Mercia Mudstone. The dark brown is Bromsgrove Sandstone, so-called because this same band of rocks occurs prominently near Bromsgrove. This porous stone forms the aquifier beneath Leamington, which is the source of the spa waters. The light green colour in the North West is a band of glacial deposits, forming high ground in the area of Burton Green. This is called Oadby Till, named from a district in Leicestershire. The rock was carried here by glaciers coming down through Rugby. There is a large amount of glacial deposit in the Dunsmore area. The map also shows the quarries used for the stone used to build the two castles in the area. Kenilworth Castle was built from Kenilworth Sandstone, mined at Castle Quarry. Warwick Castle was built from Bromsgrove Sandstone, mined at Coten End Quarry.